Doodles are simple drawings that represent our inner worlds. They express our daydreams, our ideas and all the random thoughts that cross our minds. 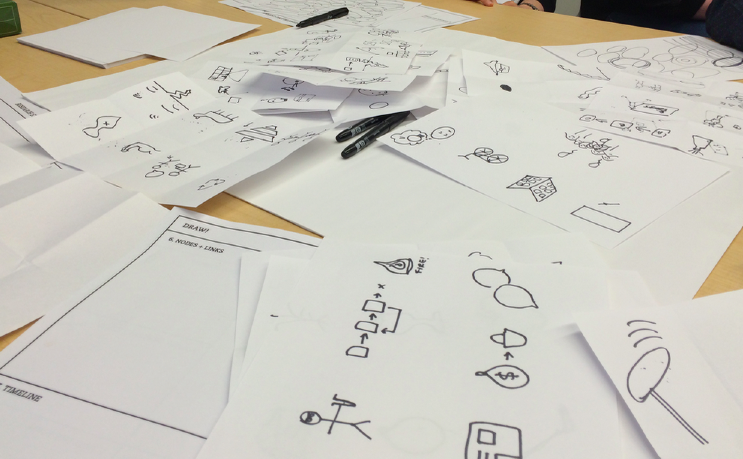 Have you ever thought of doodling your data? This is a simple technique to help us reflect about and document our experiences in the field in a unique way. Many moons ago, when I was writing my undergraduate thesis, I did not know what to do with all the data I had collected in the field. I had long pages with scribbles about my interviews, experiences and random notes I had taken while I was conducting my research. However, that piece of paper full of notes felt a bit foreign and I felt the need to bring my data back to life. So I sat down, grabbed a bunch of colours and papers and started turning my notes into doodles. As I was drawing the different scenarios and characters I had encountered in the field, I did not only revisit memories I seemed to have forgotten, but also did a fair bit of reflection about what those memories meant to me, and how they could help me answer my research questions. One of the biggest lessons I’ve learned about research (and life!) so far, is that we need to create time and space for self-reflection. If we do not understand how our identities, experiences and positionalities influence our interpretations, we miss out on important nuances of the human experience. For example, we might miss out on how emotional responses can influence the outcome of our research, or how we may be perpetuating power relations, among many others. Doodling is a way of creating space for reflection in our busy research agendas. Visualizing our notes may also highlight certain dynamics that were not necessarily apparent while we were experiencing them in the field. Why is it important for the community’s development? At Recrear we understand ‘development’ as a process in which we “deepen our connection with ourselves, each other and the world around us”. One of the main ways we can build this connection is by sharing our stories in unique, creative and accessible ways. Doodling our data not only helps us to understand ourselves better, but it is also a more accessible format to share our thoughts and experiences with others. Data analysis and research communication. Set aside an afternoon for this. Identify the characters of your story: Who are they? How old are they? Where are they from? Where do they live? What is their gender, ethnicity, race? What is their family history? Does this matter? Once you are done with this, repeat all these questions for your character. Did these characteristics affect your interactions at all? Decide on key points of your story: What are the episodes of the story you want to highlight? Why did they stand out for you? In what ways are they relevant to your research question? Use different symbols to illustrate speech, thoughts, emotions, expressions, etc. It will allow you to find interesting, appealing and creative ways to share your ideas with others. Drawing and storytelling can be challenging – If you do not feel comfortable with drawing, this technique may prove frustrating. However, keep in mind it is a good opportunity for reflection. Don’t worry about being a great artist! Were some ideas harder to illustrate than others? Why? What can I do to explain this idea more clearly? It can be time consuming – Make sure you set time aside for this activity. Unless you are using comics to present your research in public, there is no need to be a perfectionist. This is an exercise for you to reflect on how you imagine yourself, the community you are working in and your relationship with others. You can use this to visualize interviews, survey, field notes, etc. I have used it to visualize how I imagine conversations with people I have not met – like the authors of books, articles and films that inspire me. I find it is a great way to connect with their ideas and reflect about how to communicate them. Do this away from your electronic devices (computer, phone, etc). Let your creativity flow! If you decide you want to tweak your original plan, go for it! It’s part of figuring out your process. Have fun! This is not about making the perfect comic book, but about getting in touch with your creativity and your community.